We acknowledge that all people have been created equal and that every person has been created with a unique identity. Within each person exists individual strengths and weaknesses, capabilities and limitations. By grace through faith in Jesus Christ, the individual enters a relationship with the Lord whereby he is nurtured and matured. Accordingly, we want every student in our school to grow as an individual, following the course which the Lord has established. As a Christian school, our purpose, through our curriculum, is to challenge our students to attain academic, emotional, spiritual and physical excellence. 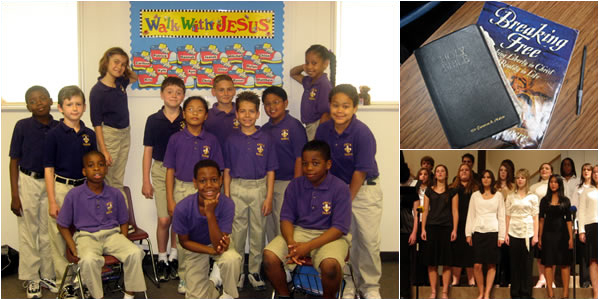 This purpose is accomplished by using a diversified curriculum with high academic standards in all subject areas, based on the truths taught in the Bible. Thus, our students will be well equipped to pursue a higher education and become exemplary Christian citizens. Our mission is to honor our Lord Jesus Christ. We want to strengthen His cause within the family network of our community. Our school shall honor the Lord by teaching our students a strict reliance upon Jesus Christ as both a solution to problems in life and as a reason and purpose for life itself.